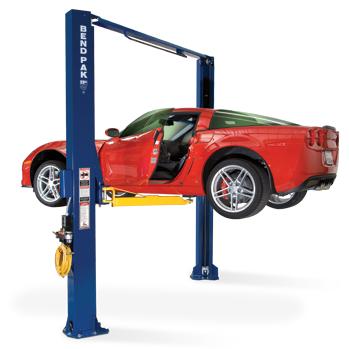 BendPak Lifts – Two-Post Lift – GP-7LCS– 7,000 lb. Lifting Capacity - Gary Bloom Sales, Inc. The GP-7LCS is a truly one-of-a-kind design. Because it fits in garages with ceilings as low as 9′, it boasts the lowest columns ever found on a permanent two-post lift. It can be installed in virtually every garage on the planet and still offers an impressive 58″ rise. The GrandPrix was invented to give you more versatility to work from home. Its extremely low-profile columns don’t sacrifice lifting capacity: the GP-7LCS offers the full 7,000-lb. lift of the other GrandPrix models and boasts a full 58″ rise. It’s hard to overstate how different the GP-7LCS is from any other garage lift. 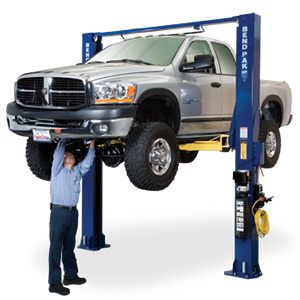 Two-post lifts have long been standard equipment for professional service bays, but many DIY’ers have been waiting for the day a model would come along that fits in an average-size garage. To this end, compromises have come in the form of “portable” two-post models. But in all likelihood, these lifts lack the GrandPrix’s backup safety features, the sheer ruggedness of its construction and its full lifting height. Not to mention, the GrandPrix comes with the same great industry-best warranty as other BendPak two-posts. It’s also backed by a full service team to support your every need, before and after your purchase. 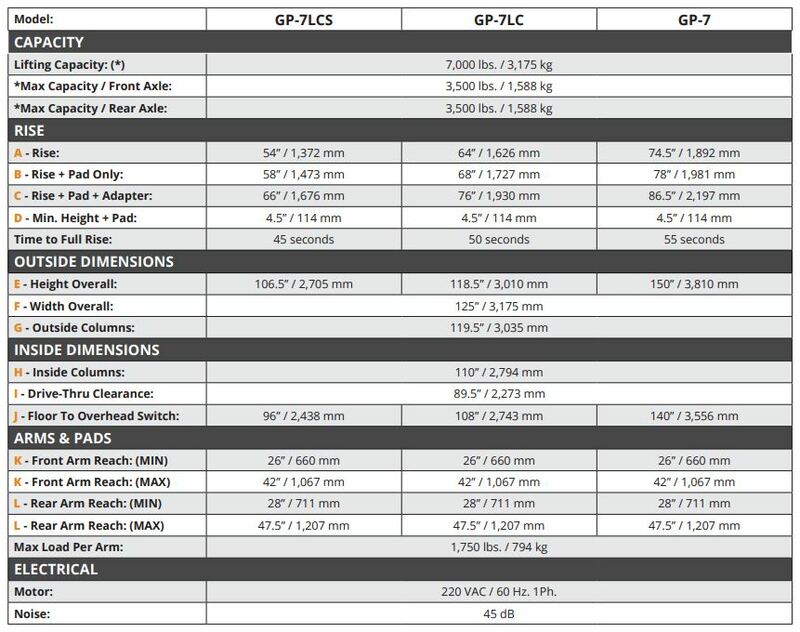 The incredible, game-changing upside of the GP-7LCS is that it stands at just 8′ 10″. Even if it doesn’t offer as much rise as high as other two-posts, its impressive 58″ is still more than what you get with low-profile, mid-rise scissor lifts. 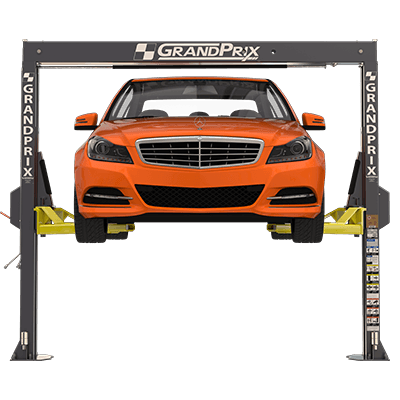 So, if you’re between a scissor lift and a GrandPrix, both of which are ideal for garages with tight space and/or low ceilings, the GP-7LCS ultimately offers more lifting height. 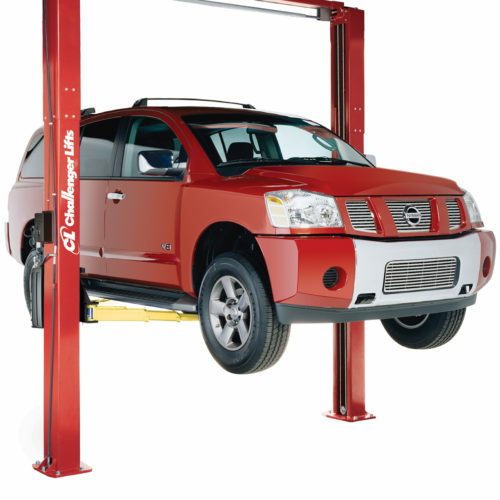 For more lifting height, we recommend the 68″ rise GP-7LC, which fits in garages with ceilings as low as 10′. Also, the standard-height GP-7 offers a whopping 78″ rise and requires 13′ ceilings. Super-slim side columns define the look of the GrandPrix. Its stunning and simple design features an overhead crossbar with a built-in auto-shutoff bar, eliminating any risk of vehicles slamming into the overhead steel beam. All this is built into an extremely compact lift. Despite the slimmer proportions, you still get ample drive-thru and clearfloor design for a look at that’s as clean as it is practical. Quad lifting cables ensure your GP-7LCS is as reliable as any two-post lift ever made. Just because it’s a short design doesn’t mean the GrandPrix comes up “short” on safety. In fact, it features twice as many steel lifting cables as other two-post lift and four-post lift models. This ensures that in virtually every single circumstance, as long as the lift is properly operated and maintained, failure in the form of uneven lifting or sudden drops is entirely eliminated. The backup cables are redundant; they’re simply there to guarantee peace-of-mind at all times. 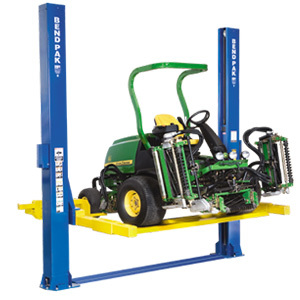 Most hydraulic two-post lifts use dual hydraulic cylinders in the side columns. That’s because most hydraulic cylinders found in car lifts are longer than the length of the lift’s overhead crossbeam. They simply won’t fit anywhere but the side columns, so the columns have to be made thick enough to house the cylinders. To solve this problem, GrandPrix pairs the lifting power of a single, shortened overhead cylinder with four aircraft-quality lifting cables. Our crucial placement of the cylinder frees up a lot of space along the sides, allowing the GP-7LCS to use a lot less steel. The result is a slimmer, safer, 100% industrial-grade lift that homeowners and professionals alike can be proud to put in their garages. Dual-capability Bi-metric arms can be adjusted for symmetric or asymmetric vehicle loading at any time. Some operators prefer to center their vehicles, while others prefer the asymmetric style that permits more door clearance. Oftentimes, user preference comes second to the actual space available and layout of the garage. That’s why GrandPrix lets you switch between both. No additional purchase necessary.